Week 2 of the Hanson’s training has now been logged. It’s been mostly easy 5Ks and 4 milers to date, but I am under no illusion that this program is going to be a walk in the park. I am already eyeing the first week in February with some degree of trepidation, when the speed training begins and the weekly mileage takes a hefty jump from 24 to 39. Two years ago, even considering a running program like this would have been unthinkable. But buoyed by a good Boilermaker run that year, when I shaved almost 12 minutes off my time from the previous year for a decent 1:34:54, and encouraged by a courtyard conversation at the end with my son and several other runners, I decided to take the next step and run a half marathon. As luck would have it, the inaugural Empire State Marathon and Half Marathon was scheduled for that coming October in Syracuse–it was far enough away that I could find a program to build on my Boilermaker preparation and get me to such an unreal distance. I followed the Marathon Rookie half-marathon program–a conventional “1-day-on, 1-day-off” program that slowly and incrementally built up the mileage over a 10-week period. Two successful long runs down the Canal Trail from Canastota to Chittenango in weeks 6 and 7 gave me plenty of confidence in myself and the program, but at the beginning of the taper week I developed a mystery injury to the muscles in the rib cage on my left side. Breathing in was fine, but breathing out resulted in a sharp stabbing pain. During my short taper runs, I experimented with shallower breathing and posture, but nothing worked. Even a gentle jog/walk down the Canal Trail the Thursday evening prior to the race was painful. I had reached that moment that I suspect every runner reaches at some point or another: should I back out of the race and play it safe, with all the blood, sweat and tears I had invested in the training going to waste, or should I try my best to run through the pain? As I went to pick up my race packet that Friday evening, I made the decision to get to the race an hour early and do some gentle runs around the parking lot to see how I felt–if they went well, I would give it my best. Fortunately, the running gods were smiling on me that chilly October morning. A couple of tentative runs around the parking lot of the Alliance Bank Stadium told me that my side was going to be a little sore, but nothing I couldn’t live with. As I lined up and waited for the gun, my nerves were still jangling, but a light-hearted moment just after the gun went off put me a little more at ease. As the pack started to half-walk/half-jog to the start line, everybody stopped without warning as some people in front of us negotiated a small puddle–we all bumped into each other and laughed, but the tension for me had been lifted and I settled in for the race. I hit my first 2 splits right on time (I was targeting ten-minute miles for a 2:10 finish) and made my way up the Parkway feeling pretty comfortable. 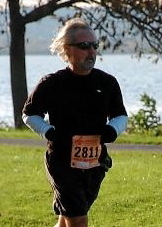 Given that it was October in Syracuse, I had dressed in layers of moisture-wicking fabric, which was a decision that really paid off once the course took us into Onondaga Lake Park. Every bend at that point of the course seemed take us into a new climate zone–from unseasonably warm to windy and freezing in a matter of seconds. By then, I had hit a very rhythmic groove and was feeling good, if a little humbled, as the lead runners raced past us on the inbound stretch. A State Trooper watching from the Thruway bridge provided a moment of fun as he pointed his radar gun a some runners and threatened to issue speeding tickets, then it was time to make the turn and head inbound myself. But my enduring memory of the race occurred about 2 miles out. I could see runners ahead of me starting to flag, and 1 by 1, I began to pick them off. I am not a really competitive person by nature, but I have to say I felt a little thrill each time I passed a runner at this late stage of the race. And as I entered the chute, I fought off a late challenge from a female runner who had kept pace with me throughout the race to end up beating her (my apologies, Elizabeth Klein of Easton, MD) and finishing at 2:10:58–right on the nose for my ten-minute mile pace. I knew right there and then that I was going to go for a full marathon. This entry was posted in The Flat-Footed Fox and tagged Boilermaker, Empire State Marathon, Erie Canal Trail, half marathon, hanson's training, running, Syracuse NY. Bookmark the permalink.